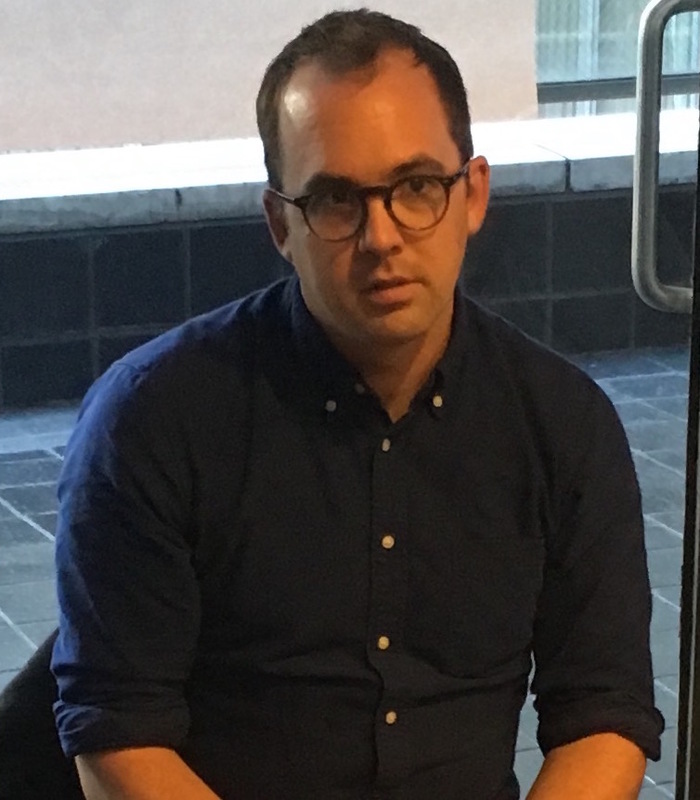 Artist and moving image archivist Andrew Lampert has been working through the challenges that face presentation and preservation of moving image works. In this interview, Lampert gave great feedback to our Expanded Cinema research team about various aspects of presenting and preserving complex media art: digital vs. analog, performance vs. installation, iterative life of works, presentation and archival material, and the importance of documentation. Julian Ross, Ann Adachi-Tasch, and Go Hirasawa conducted the interview, at New York University, on March 9, 2017. Media conservator at The Museum of Modern Art, Peter Oleksik offered insight into how an institution like MoMA handles production and exhibition of complex media art. He let us know the technical ends of their work, from creating backup copies to how to procure obsolete equipment, from updating technology to consideration of digital presentation. Julian Ross, Ann Adachi-Tasch, Hiroko Tasaka, and Go Hirasawa conducted the interview, at MoMA, on March 9, 2017. Peter Oleksik is Associate Media Conservator at the Museum of Modern Art (MoMA) where he has been working since 2011 to conserve the museum's vast time-based media collection across curatorial departments. As part of his work at MoMA, Peter is a member of the Matters in Media Art (MMA) team, a collaboration between SFMOMA, The Tate and MoMA to provide resources on time-based media conservation. Peter lectures and publishes regularly on various topics related to time-based media conservation internationally. Additionally, Oleksik regularly works with independent artists, filmmakers and musicians, such as Jem Cohen, Fugazi and Sonic Youth, to preserve and provide access to their media collections. Oleksik received his BA in Cinema Studies from the University of Southern California and his MA from New York University’s Moving Image Archiving and Preservation (MIAP) program, where he has served as an adjunct professor. Adachi: What was the process involved with Nan Goldin's Ballad of Sexual Dependency? Did you create another copy? Oleksik: We did duplicate the slides. We made several orders of duplicate slides with an eye towards the fact that slide film is no longer manufactured and there are limited resources at the moment to duplicate slides. If we had approached the piece for an exhibition where this immediate concern of format obsolescence isn’t so prevalent, we would have made two or three sets. But in this instance, we made five or six, to cover not only this exhibition, but also the longer care of the work in the collection. We wanted to seize the moment when we are visiting this work. In terms of our institutional workflow, exhibition is the moment where we can really focus our attention on a piece. So, in this case, we did a significant project to scan all of the slides and then output them back out to transparency film. This lab in Massachusetts, Chicago Albumen Works, is one of the labs in North America that still does an output to transparency film, which can be mounted in slide mounts. Oleksik: Yes, it's a lab specializing in digital scanning and printing. They will scan all the slides and then output back out onto this transparency film, and then cut the film and put them into slide mounts. However, it's not one-to-one. Slide film has a much higher contrast than the transparency film they use, so you can't get the blacks as rich as you could with say, Ektachrome, for example. Red or magenta is really hard to get in a sweet spot, for lack of a better term, we’ve found. So that was a real challenge, especially with 689 slides, to go one-by-one and color correct. It's a very laborious kind of duplication process. In the past, we could just go and do photochemical/optical duplication, and you didn't have to worry as much because it's closer to a one-to-one process, as the film is the same or similar. So that was one element of this exhibition. And then in terms of the hardware, it was essentially assessing the condition of the projectors and playback system and getting it all running. We had shown the piece previously, in 2008. So those towers you saw, as well as that software and all the Dataton connections, came into the collection at that point. So we're using all that same hardware from when we originally acquired the piece. Additionally, we purchased a few older Macs that run OS 9, to allow us to run the Dataton software. The work was programed in that software, which can only run in an OS 9 environment, and has typically been run this way. However, we found out from our colleagues at the Tate Modern that you can output the sequencing as an audio file and run the piece that way. So, we did an audio output of the slide transition software and exported it to an mp3 audio file and compared the two, to ensure that the timing was the same. We did this to give us multiple ways to show the sequencing in the future, especially one that isn’t reliant on software running in an antiquated operating system. We also purchased many, many Ektagraphic III slide projectors from various sources like eBay, which we would then assess and condition for the show. We'd open them up—we brought in an outside expert, Maurice Schechter, who would clean them and do a once-over of their basic operation. One thing we observed when we would open them up is a plastic cam gear, which allows the slides to rotate or transition. We found one out of every five would have a crack. It would still function and operate, but it was kind of unknown in terms of when it would break. So, we put the cracked ones aside because of that unknown. We could fix it, but it would take about a half a day to remove that cam, get a new cam, and install it. The projectors are still pretty cheap on eBay—you can find them for $50 to $100. Because they're so cheap we decided that rather than get an expert to come in and do this and take up this much time, we would just keep buying more projectors to swap them. It was more economical to just stockpile them, which also allowed us to establish a large pool of them for the future. For ones that came fully functioning, we would do a full conditioning of them. Meaning we would clean them, grease them, and test them. We bought different kind of lubricants geared for the Ektagraphics and for this kind of operation. Another thing to keep in mind is these were not meant to run eight hours a day, seven days a week. As a result, a lot of the failures we were seeing were because they were not meant to operate under these grueling conditions. Everything else in the playback was pretty solid—the Dataton connections, the Dataton pax timing units, we've had no troubles with. It's really just the slide projectors. Slide projectors and carousels themselves were the two main problematic variables that we dealt with throughout the run of this exhibition. Adachi: So for the long duration exhibition, when it does break down, you just replace them directly from the show? Oleksik: The slide projectors? Yes, in large part it's because the show needs to be on. To minimize downtime for it, it’s best to shut the projector down, take it out, and put a new one in. Then, you can take that projector and go and fix it. It's really just for the presentation of the piece that we would immediately swap one out, and then bring it back and repair, or just buy a new one depending on how it failed. Adachi: Does happen like once a week, or—? Oleksik: No. It was once a week for a couple of months. Then we’ve had no failures for a long while. Adachi: Because you repaired them already, or—? Adachi: How many backups do you have? Oleksik: Backups of projectors? We have four projectors at the moment. I would say we went through a total of, I think, 12 over the course of the show that are now in various states of failure or repair. And then we bought 15 or 16 in addition to the nine necessary for the piece to run, so we’ve gone through a total of 24 or 25. We did it in waves, where we would buy five or six, condition assess and fix them, swap them in and out, and then once we got low we would have another wave of purchasing. We always made sure we had at least two backups ready to go in the booth, so that when one goes down one can get swapped immediately. Hirasawa: How many backups copies of the slides are there? MoMA has the original, the digital, as well as the duplicates? Oleksik: It’s an editioned work. We have the analog slide version, and then we have essentially a digital version that the artist has approved. A unique thing about Ballad of Sexual Dependency is that each edition is unique, so there's a set of constant slides, but then Nan [Goldin] tailors the selection of other slides for each edition. Our documentation from when we showed it the first time was not as robust as [that which we created] now, so we didn't fully know what our sequence was until we watched it. With this exhibition we got to really know the sequencing extremely well. Adachi: How do you document your current installation, all the technical aspects? Oleksik: We have built kind of an instantiation report or display documentation report template, and the reason I say instantiation is, it has prompts built into it where it records all decision making that happened in the course of preparing it for exhibition. It’s adapted from the template that Joanna Phillips developed at the Guggenheim museum. So questions like: Who was the curator involved? Who was the exhibition designer? Who was the conservator? All these people [are listed] and then their role in various decisions that were made. So, for example, we're actually showing the Ballad the largest it's ever been shown. It's typically around a 15-foot width in terms of the projection size. We're showing it at 20 feet. And so, what we would do is document what went into that decision-making—in this case it was a curatorial decision, with the artist’s approval. We capture all of that information and document everything. We'll measure the room and do a Google Sketch-Up of the room, the throw distance of the projectors, height of the booth, all aspects that we can document of the environment and then do a full schematic of the various equipment and wiring diagrams with the projectors, how they're connected to the computer, what kind of connection type that is, basically anything that's connected to anything in terms of electronics we will document the full path. All that is bundled together into our instantiation documentation to show that in 2016–2017 at MoMA, this is how Ballad was exhibited. We've also video recorded the full show a few times. Ideally we would have an artist interview as well, to get the artist's view on how successful the exhibition was asking, “What would you change? What would you do differently? What did you like about this installation?” and things like that. Adachi: Do programs like the Max MSP program and all those files go in the same folder? Oleksik: The slide scans and things like that, those would be considered part of the artwork. We make a semantic split: the control software and slide scans and things like that, because they would be dedicated to the work, would go into our digital repository, and then the video documentation we did of the piece or the pdfs of all the slides, with their orientation and then their slide number and things like that, that all goes into the artwork folder, in a digital form, but just in a different place. Adachi: Was the digital projection ever a backup plan for this piece in this exhibition? Oleksik: No, the curators wanted to show the 35 mm version of it. I don't know when the digital version came about. I know Nan still prefers the analog version. So in terms of this exhibition, no, it was never really an option. Adachi: But the artist is open to showing digital? Oleksik: Yes, Nan has made an authorized digital version. And it's been shown before, so Nan is fine with that [the digital version], which came directly from her. Adachi: One of the things we were just talking to Andy [Lampert] about was this difference between the performance events and the installation. He was saying that the digital version can exist as long as it allows people to see it. So one of the option for the Cinematic Illumination piece is that the performance of it could be on an analog slide projector version but then thinking of the duration of the exhibition [and the durability of equipment and films], use the digital version. I wanted to ask you about any ethical decision-making. Oleksik: Right. In this instance, we didn't go to the artist asking for a digital version, it was presented to us [by the artist], so there's less of an ethical concern there. If this artwork did not have a digital version, with the hardware obsolescence, or all the technological obsolescence that this piece has, as well as the format obsolescence, it is definitely something we would think about: can this be—especially since it's so cinematic in its presentation—presented digitally? But it would be a conversation with many people. It would be an option that would be available to us, but we'd have to talk to a lot of stakeholders about it and whether it was right for the work or not. And it sounds like you guys have three ways to approach Cinematic Illumination: performed as 35mm, programmed as 35mm, or digitally. It's interesting because Ballad was also originally performative. Nan would go into clubs and just have a projector and project it herself, live. So I guess it is very similar. I've always wished we could do the performative Ballad where you just have a bunch of people triggering the projectors. You have these three ways to see the piece—the programmed 35mm version, the performed version and the digital version—how does that change it? Tasaka: Do you discuss this with curators? Oleksik: Yes, and it's a discussion with curatorial staff first and foremost. As well as with the artist, if they’re available. With the artist in this case based partly in New York and accessible, we definitely talked to her. But if the artist is no longer with us, then it's a question of, how do we navigate those kind of ethical concerns? From a conservation perspective, we would research, document and understand all aspects of the piece first, and then provide options for treatment or reconstruction to our curatorial colleagues and representatives of the artist to discuss. Having a discussion around all of the concerns is critical, with various people inside and outside the institution. Ross: Do they ever mention that they would like to see a performance version? Oleksik: Yes. So for part of this exhibition musicians would periodically come in and play live in conjunction with the piece. Ross: And there's different editions for this work. Was there ever discussion of showing other editions, or what to do with those other editions? [Are they in] different orders? Oleksik: It's the same order, but different slides in some sections. Peter Galassi, who is the former chief curator of Photography, and a few curators in the Photography department, worked very closely with Nan in 2004 to make an edition. Their names are in the credit slides. So no, I mean, our edition is our edition and that’s what we would show. One thing we want to do from a conservation side is really talk—and we've done this kind of informally with other institutions who own this piece too—and compare notes about how they got their slides. What's the best way to duplicate them? And what's their playback software? We actually worked with the Tate pretty closely, because they have another edition, in understanding the playback system. They are really great collaborators and we were able to discover things about the work. The playback sync track is the same on their edition as ours, so we found it’s uniform among the editions—it's just the images that change. Tasaka: I have a very practical conservation question. How do you preserve the projectors? Oleksik: In the case of Lovers [Teiji Furuhashi Lovers, 1995], we would dedicate them to the artwork, so we would basically store everything together. With Lovers, that tower that’s integral to the artwork is kind of just packaged up, and then the projectors will live with the tower. And all that will be kept with Lovers. With Ballad, it's a very good question. Right now, a few projectors are dedicated to it. And I think we would keep that pool of projectors dedicated to Ballad. But those remaining, we have our own kind of—we call it a legacy equipment pool, with various kinds of obsolete equipment that many pieces need, but not dedicated to one piece in particular. We just maintain those projectors on their own. We need to have 20 slide projectors in working order, which 10 to 15 pieces can utilize over time. So instead of dedication to one [piece], we kind of spread them out among the works that need that particular technology. Ross: And are those checked often, the ones that you put in this legacy pool? Oleksik: At the moment, no. We haven't really firmly established the pool. But once that is built up, we’ll have a more formalized policy and procedure on that, yes. I mean, ideally, we would once a year go through and condition check all equipment. But right now, it's more of a pilot program.